Obstructive Sleep Apnea (OSA) is one of the most common sleep disorders, affecting over 20% of the healthy adult population in the United States. Men and women of all shapes and sizes can suffer from OSA without ever knowing it. In fact, it is estimated that 90% of the people who have Obstructive Sleep Apnea have never been diagnosed. Obstructive Sleep Apnea occurs when the airway begins to collapse and restricts or completely blocks air from getting into the lungs. It is common for this to happen a few times each night, even in people who do not have OSA. When a person does have Obstructive Sleep Apnea it can happen anywhere from 5 to over 100 times per hour, and most of the time, the person has absolutely no idea that it is going on. When breathing stops, it wreaks havoc on the body. Oxygen levels in the blood stream will drop, heart rate will increase, specific hormones will be released, ADN signals will be sent to the brain to increase breathing effort. A bed partner may hear gasping or choking sounds, but the person with Obstructive Sleep Apnea is generally unaware. Obstructive Sleep Apnea has been linked to a variety of other serious health risks. Who Should Treat Sleep Apnea? Dentists who treat Sleep Apnea are especially qualified to identify certain signs of the disorder, as they spend large amounts of time looking directly at their patient's airway. These Dentists are also uniquely qualified to treat Sleep Apnea with an Oral Appliance, worn during sleep. The American Academy of Sleep Medicine and the American Academy of Dental Sleep Medicine work hard to create guidelines and protocols that your doctor will follow when treating Obstructive Sleep Apnea. While you may see late-night informercials for products that claim to stop snoring or OSA. they rarely work and can cause other serious problems. This is why it is important to always seek the advice of a health care professional regarding Obstructive Sleep Apnea treatment for you or your loved ones. There are a variety of treatment options available for Obstructive Sleep Apnea, although not every option is appropriate for every patient. The best way to determine the sleep apnea treatment option that is right for you, is to discuss your symptoms and sleep study results with your doctor. 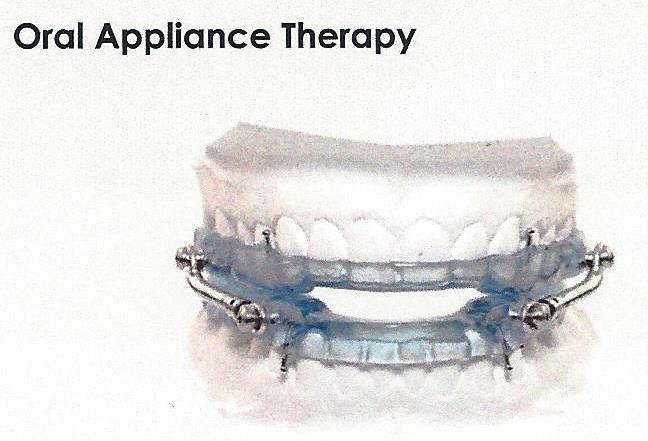 The least invasive sleep apnea treatment is Oral Appliance Therapy. Not all snorers have Sleep Apnea, but almost everyone with Obstructive Sleep Apnea does snore. Sleep Apnea causes many people to feel tired during the day, even after getting a full night's sleep. Spouses or roommates may hear a person with Obstructive Sleep Apnea gasping, or even holding their breath during the night. It is very common for a person with Sleep Apnea to also have elevated blood pressure. Not all Sleep Apnea patients are overweight but a BMI over 35 increase the risk of Sleep Apnea significantly. If you are at all concerned about your risk of OSA, simply discuss it with your dentist. If it turns out you are at risk for Obstructive Sleep Apnea, a very simple test, taken in your own home, will give you and your dentist the necessary information to decide if you are in need of sleep apnea treatment. If so, they can discuss what sleep apnea treatments are best for you. You can contact Northridge Dentalworks now to schedule an appointment. Dr. Niloo Tavakol and her team will determine if you need sleep apnea treatment and which option is best for you. Call 818-882-0100 to set an appointment for your sleep apnea diagnosis in our Northridge office now!